2016 was all about the running, with the road bike getting fresh air only a handful of times. The sporting aim of the year was to qualify for UTMB, and this was achieved, albeit with full knowledge that entry is still a lottery- you have to be in it win it! The draw is released on 12th January, and even if unsuccessful this time around, the events completed for qualification points led me on a journey that was pretty awesome in its own right. 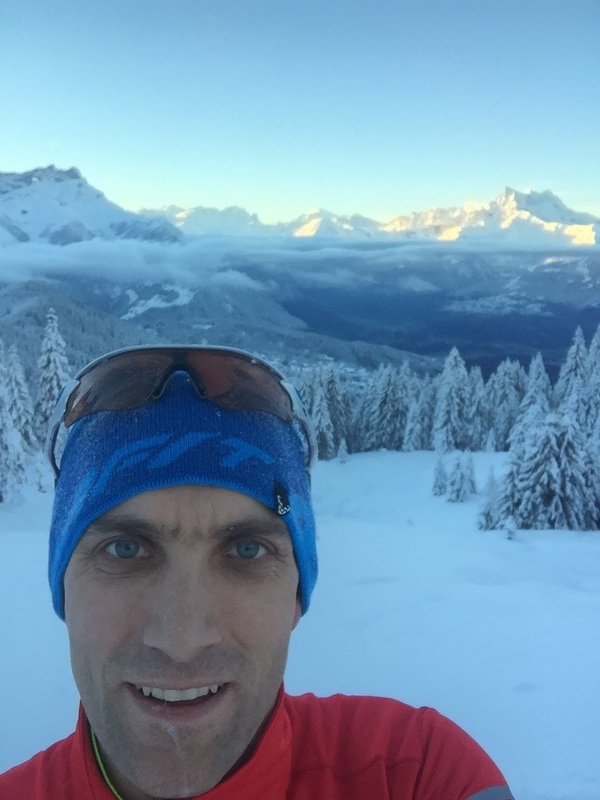 The year started with a typical winter mixture of trail runs, ski tours when the conditions were good and nordic skating, all building the engine. The highlight of the month was when the deep snow came, making skimo laps from the front door possible, skinning out to the field at the end of my road and looping the fresh powder in the pastures. A couple of runs stick in my mind from February: the first was cranking out some hill reps in a blizzard, a session I remember thinking would help toughen me up and test my kit. It helped. The second was a training marathon, running down the mountain for a flat 15km before turning and heading back up. The trouble was, the way back up had plenty of snow in the shady sections, changing the pace to a painfully slow one just when I was running out of ‘oomph’ anyway; in hindsight it was a good session to help deal with being forced to go slowly so close to finishing, something that would come in handy in races. 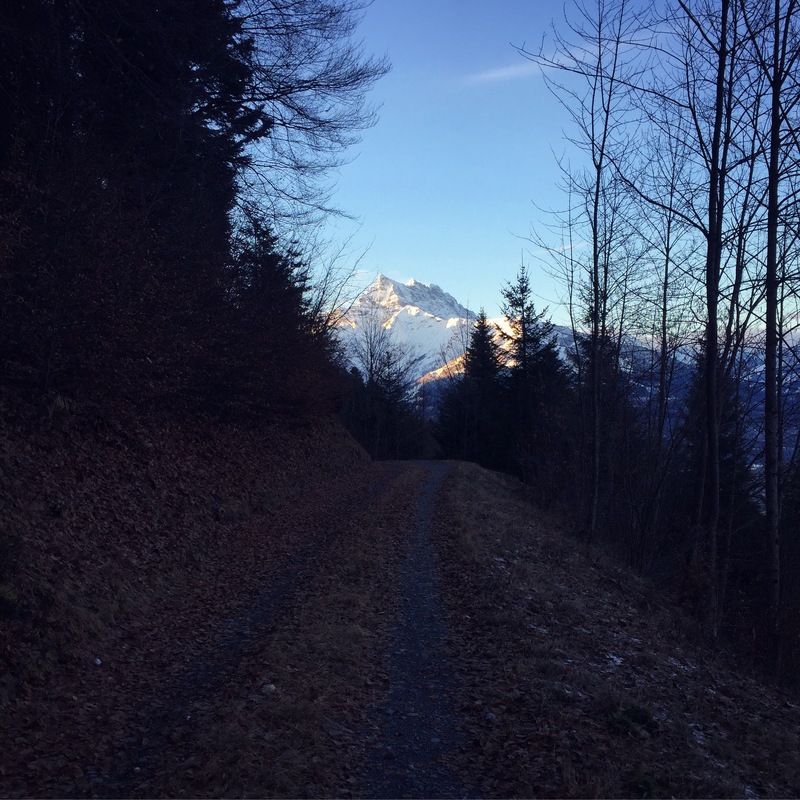 The long runs were in full swing by March, and a consistent theme of the first half of the year was discovering new trails further from home that injected new enthusiasm into my training, vindicating the decision to embark on the ultra project in the first place. One such run took me across a couple of valleys onto paths less trodden, past waterfalls that must only be seen by a few people each year. It is a wonderful privilege to live somewhere that continues to inspire. April brought the need to keep up the mileage and also to travel for family and work, with the stand-out training run not in the Alps, but in the undulating green hills of North Hampshire, UK. When visiting family I scoured the map for an interesting long run, when I stumbled upon ‘Watership Down’ 15km from where I was staying. In my ignorance I had not realised this was actually a place, so headed out for a long one to go and see some rabbits. The best bit was not finding dead rabbits (there were lots) but finding myself crossing ‘the gallops’, a hilltop race horse training track. 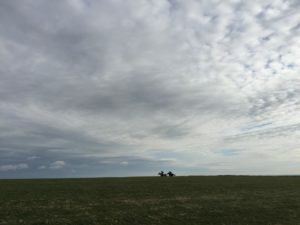 As I did so several pairs of race horses passed me clearly doing some sort of interval training; running on the path alongside them was invigorating, their power and speed infectious. I was reminded how the simple act of getting out of the door and moving can bring all manner of surprising experiences. May was all about the Ultra Tour du Mole in the French Alps, a bonkers race that was basically 3x vertical kilometres with the down thrown in as well. This served as the perfect lead in to the summer ultras, but did leave me with my first bad ankle sprain of the year for which I have still been paying the price. 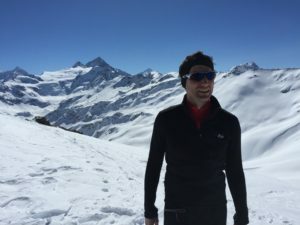 I learned how to use poles effectively on steep vertical and to stow them for the descents, and that I would be better off carrying ibuprofen in future races. 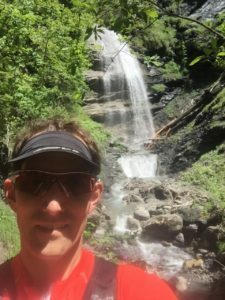 After many misfired attempts to reboot training after the sprain, I finally got going by the end of June, and managed to get in the ‘big week’ that was a pre-ultra target. I had read somewhere that a good goal was to cover the same distance and elevation in a week of training as that of the race, so I pulled out a 114km running week towards the end of the month, feeling confident that the monster to come was actually possible. The taper began in early July, and a quick hop to the UK to see my newly born niece provided the chance to get in one final speedy effort, at the Basingstoke 5k Park Run. I went out hard, and on the last lap it was down to just me and one other chap. The course was surprisingly hilly, so I used my alpine advantage to nail the final descent, getting a 10 metre gap. The reality however was that my training was not exactly geared up towards generating a finishing kick, so I was passed in the final 500 metres to the line, finishing second in just over 18 minutes. Next was the ‘A’ race of the season, the formidable Trail Verbier St Bernard. This was a brute of a race, but I knew I was ready for it and my slow and steady strategy paid off with a respectable finish. The event was everything I’d hoped for and more, with slick management, epic scenery and the challenge I sought. Next year it will be faster or bust! I allowed myself 11 days of no running (1 day for each 10km raced in the TVSB) and then started to rebuild into August, knowing that the base was there and the key was to avoid injury and burnout. 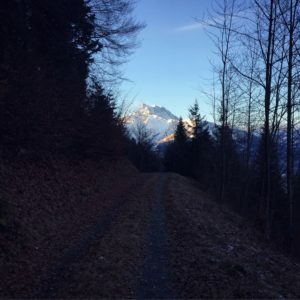 I did manage two long runs, the first of which climbed up an incredible trail from the Rhone Valley to the Croix de Javerne, the reward being one of the finest ridges in my region with views to the valley far below, Lac Leman, and home. The second was an ascent of the Dents du Midi with a friend, finding wild conditions at the summit and practising some loose scree descending back down. 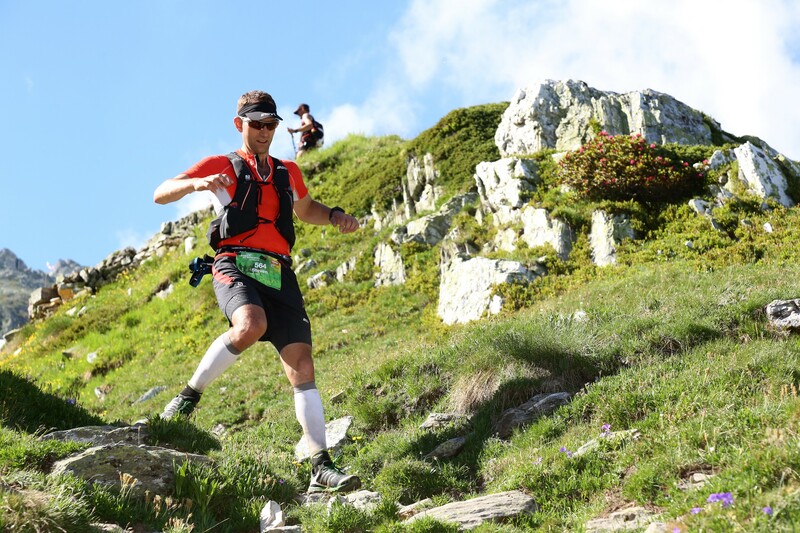 Then came the Ultra trail du Barlatay, a jaunt around the Vaudoise pre-alps with an interesting 11pm start time. The weather was not kind for this one, and lessons were learned about trainer choice in particular. I won’t forget the mud and cow pats in a hurry. Work got busy in September, and the runs were short, but hey ho, I figured the hard training for the season was already in the bag. I ventured out for one 3 hour run taking in three of my favourite local ridges, but paid the price for doing too much too soon by suffering a repeat of ankle troubles. A race pace mountain run the week after this made things worse, but my competitive ego got the better of me… another lesson learned. It was a pressured period ahead of the Défis du Jublié, and hours of training were seriously curtailed as I also nursed ongoing ankle issues. I was however fresh as a daisy for race day and this worked well, converting a fast start into a top 10 result- again, lessons were learned, this time that I can experiment with a faster pace from the outset, and need a good taper before big events! This race was pretty much my last run of the year, with an MRI revealing ligament damage that had not fully healed from the earlier sprain, with me compensating and creating a chain reaction of related ankle/calf problems. November was rest, rest, rest, with a couple of short ski tours thrown in when we got some powder. Physiotherapy helped to iron out all the compensatory issues around the ankle, but activity was pretty much non-existent. The upside was investing in family time! Finally short runs could resume in late December, but nothing above 20 minutes, a far cry from the year before where mileage was already getting high. My great hope is that a lengthy enforced off-season has left me mentally fresh, ready to ramp up the mileage towards summer 2017.